Yalantis works with entrepreneurs and established companies all over the world. Our clients have different business needs, require different services, and expect different levels of control and responsibility in their relationships with us. To meet the requirements of each unique client, Yalantis offers three distinct engagement models, which are frameworks that define the collaboration between us and our clients. We call these engagement models Managed Product, Extended Team, and Managed Service. All three models ensure transparency during the development process. We’ll describe the Managed Product, Extended Team, and Managed Service models in detail to help you understand which best meets your current needs. This is our most frequently used engagement model, where Yalantis acts as a technical solution provider. As a solution provider, we have a wide range of responsibilities, designing and co-creating a product with you. This is a suitable model if you have a clear business vision for the project and know your timeframe and budget. In this case, our team sees the whole scope of work and requirements and can deliver your product within a strictly defined timeline. We work as your technology partner for the entire product life cycle, from the initial product concept through development and product launch. At your request, we can provide continuous product optimization after release (which involves signing an additional contract). The greatest advantage of the Managed Product model is its predictability. At the beginning of our collaboration, we provide you with a product concept as well as projected functionality. You know up-front exactly what results you can expect, at what cost, and within what timeframe. The Managed Product model helps you make informed business decisions. What does the Managed Product model offer? A carefully crafted product strategy aimed at achieving your business objectives. We visualize this strategy using a roadmap, outline a project development plan, and prioritize our work. 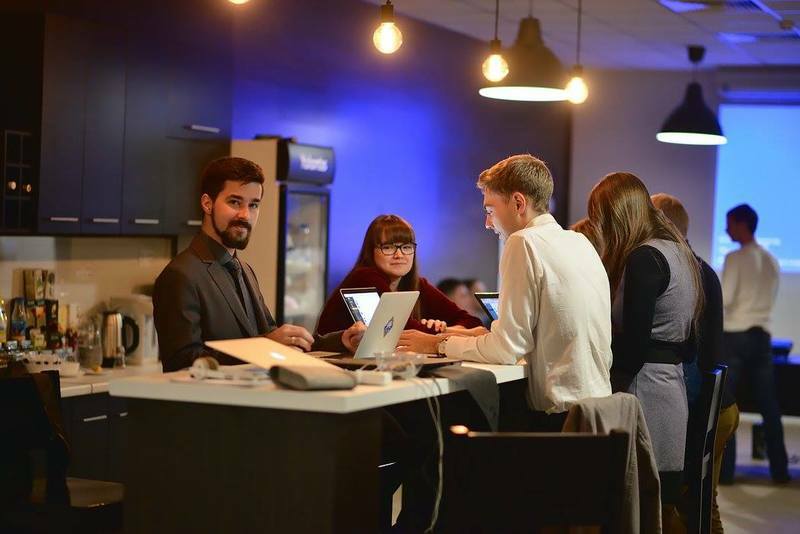 A committed team complete with a business analyst, a project manager, a designer, QA specialists, and iOS, Android, or web developers who create software from the initial idea to the delivery stage. 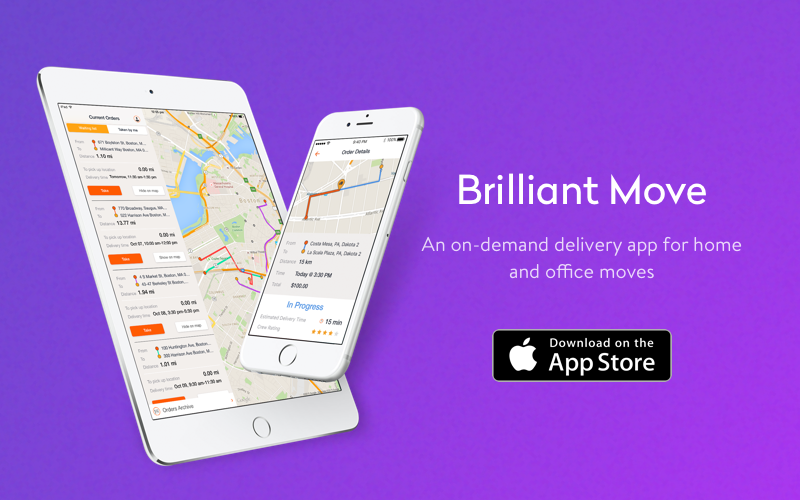 Guaranteed delivery at the end of each iteration. A well-designed, well-tested, and fully developed product. Management services that ensure transparency of work. We create reports and demo versions on a regular basis. How does the Managed Product model work? Traditionally, our software development life cycle consists of three stages. Each stage is characterized by specific activities. First of all, we communicate with you and gather information about your project. This information includes your expectations for the project, business problems you want to solve, your timeframe, and your budget. Our business analyst then carefully analyzes all of this information and finds a technical solution that effectively solves your business problems and requires minimum effort and investment. The business analyst tries to find the best value for your money. At the same time, our developers conduct research to define the most suitable technology stack for the project and our designers analyze your requirements and create wireframes, which are low-fidelity application screens that demonstrate an app’s UX. At the end of the planning stage, you get a detailed estimate, user stories, a specification document, a project schedule, wireframes, a test strategy, and a work breakdown structure. In some cases, we also provide a partial UI design and communication plan. The duration of the planning stage depends on the size of the project, but in most cases it takes a few weeks. This stage is important since it ensures that we’ll deliver the product you expect. At this stage, we design the UI, develop the frontend and backend, integrate APIs, perform testing, and fix bugs. Our team fully manages your project, so you don’t have to spend your own time on project management. Naturally, you call the shots. But we let you focus on building your business while we focus on building your product. Following the Agile methodology, we divide the whole development process into two-week sprints. All specialists work simultaneously to speed up development and cut your costs. 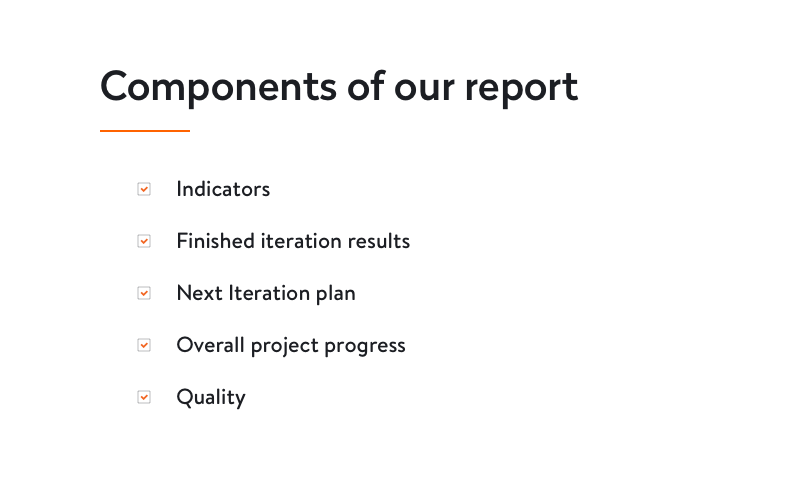 For process transparency, we regularly provide you with reports so you can see the status of work. We also prepare demos to show the results of our work to stakeholders using video presentations, recorded video, tables, graphs, and diagrams. Indicators. See the risks and issues we’ve encountered and explanation of how our team can deal with them, plus get a progress overview. Finished iteration results. An iteration report shows total hours planned against total hours spent within the total duration of the project. See the status of every user story in your project. Next Iteration plan. This shows what scope of work will be done in the next sprint and the estimated time for each user story. Overall project progress. This includes a burndown chart, sprint budget, and a Gantt chart. The burndown chart shows how much time is left in comparison to the project baseline and is based on the high case estimate. The Gantt chart shows the list of milestones related to the delivery of certain functionality and the final expected release date. Quality. See how many bugs were found in the project. Before each sprint, we plan the scope and provide an estimate for that scope. We only begin an iteration after you’ve confirmed the scope. If you decide to change something or add new features to the product, our project managers will analyze the new requirements and create a detailed report of what should be changed and how it will affect the development life cycle. We’ll discuss with you the best way to implement all changes without harming the quality of the product and increasing development time. This is an optional stage that requires signing a separate contract for three or more months. At this stage, we maintain your product after launch to ensure that it meets the needs of users. This model is also referred to as the Dedicated Team model. It’s a perfect solution for fast-changing projects. The Managed Service model also works great when you have part of your team on-site. In this case, we work alongside your on-site specialists. If you can’t define the timeline, budget, and entire scope at once but have a high-level vision of the product, we recommend choosing this model. In turn, you’ll get a team that can instantly respond to every change in the project and effectively adapt to new requirements without constantly re-estimating the whole project. Yalantis ensures the quality of service provided under this model and assumes all risks of meeting the service commitment. With Managed Service, you can focus on strategic management while we manage the execution. What does the Managed Service model offer? A team that meets your requirements. Great results that meet defined performance criteria. Ability to quickly adjust the project scope to new requirements. Fast response to user feedback. Scalability based on business demand. Project and account management services. With this engagement model, Yalantis acts as a reliable technical partner that can offer solutions for every particular case. How does the Managed Service model work? This model works similarly to the Managed Product model but has several distinctive features. Since the scope of work isn’t strictly defined, we create a roadmap and specification for one or two sprints, then discuss it with you. This provides flexibility in terms of implementing new features and making changes in the project. 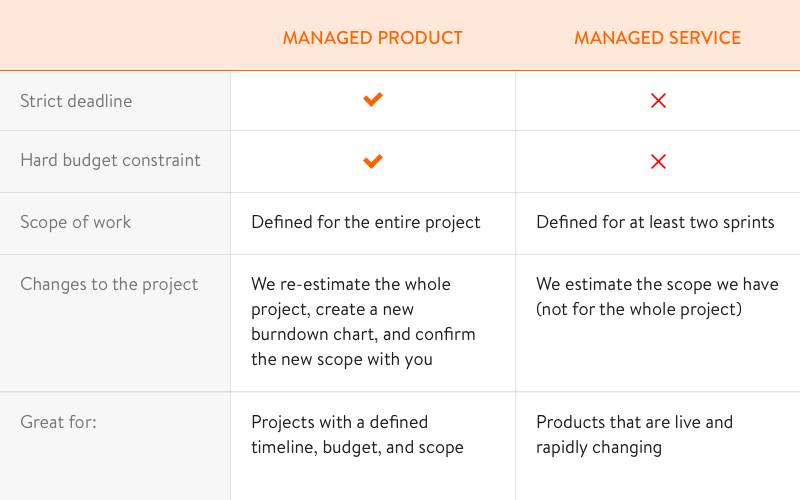 The table below shows differences between Mandaged Service and Managed Product models. The Extended Team model is suitable for clients who want to extend or strengthen their team with key specialists. With this model, our specialists become yours for a specified period of time. This model is the best fit for team leaders or CTOs who have their own SDLC processes and want to manage development themselves. The greatest advantage of Yalantis’ Extended Team model is the speed with which you can complete a project. Just tell us what talent you’re looking for, and we’ll provide you with the right people within the agreed timeline. What does the Extended Team model offer? A perfect team (or even just one specialist) with the expertise you’re looking for. Considerable time and cost savings. Administrative management. We take care of account management, administration, and taxes. Quality control. We take responsibility for the performance of our specialists and ensure the productivity of your extended team. We regularly review code and design activities within the project. How does the Extended Team model work? Define the skill set needed for your project. You can interview our recommended specialists and choose those you would like to hire. Yalantis assembles an extended team based on the required skills and relevant experience. After signing the contract, you can build up a product backlog and get to work. Our specialists adjust to your work processes, and you coordinate the project. We sign a deal for at least two months. All your specialists work full-time for your project, so they’re deeply engaged in it. Choosing the right engagement model is the first step toward effective collaboration. If you want to learn more about our engagement models or figure out which model best fits your project, you can always contact us.